Posts Apex Is Having A Black Friday Sale! Apex Is Having A Black Friday Sale! 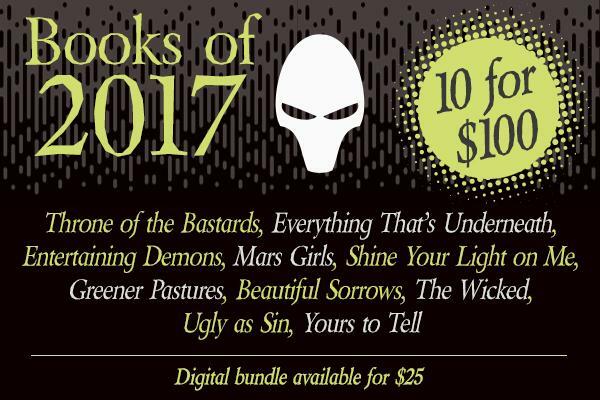 Apex Publications is having a huge Black Friday sale, and this basically means your Christmas shopping is done. From now until Monday, everything in the Apex catalogue will be 30% off with the code CHEER17. They put out beautiful books full of dark wonder, so if you aren’t familiar with the Apex authors, this is a wonderful chance to treat yourself. But wait! There’s more! Starting on Friday, Apex will run a series of four bundles that can be purchased together for huge savings. For example, I’m in the 2017 bundle with my book Beautiful Sorrows. There is a place where sorrows pile up like snow and rest in your hair like cherry blossoms. Boys have wings, monsters fall in love, women fade into nothingness, and the bones of small children snap like twigs. Darkness will surely devour you–but it will be exquisitely lovely while doing so. Mercedes M. Yardley’s Beautiful Sorrows is an ephemeral collection encompassing twenty-seven short tales full of devastation, death, longing, and the shining ribbon of hope that binds them all together. There are also three other bundles, which you can see here, here, and here. Remember that the bundle sales run Friday through Monday, but the 30% off CHEER17 code is active now.